The above quote could not be truer...and this blog will illustrate that. So, anyway back to the trip...after my mom and I freshened up a bit, we headed out again. 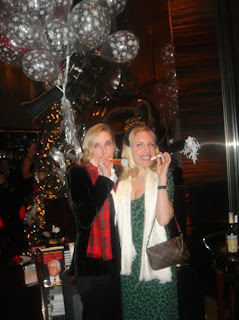 This time we were off to our New Year's Eve dinner at Le Cirque. 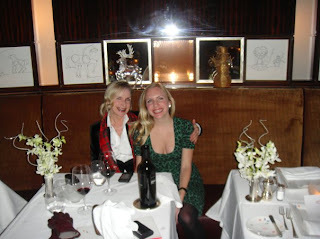 Le Cirque is a "circus" inspired restaurant, and my mom and I had actually celebrated her 50th Birthday their 5 years prior. So we felt like it was the perfect place to ring in the New Year. The restaurant was rather crowded because of the holiday, and we were seated right next to two different couples. One couple was on their first date; the other was a couple that had been married for quite awhile. It was amazing listening to the contrasting conversations between the two couples...side point: I was not eavesdropping...I just could not help listening because there was only about 6 inches between me and each couple. The older couple spent the entire dinner talking about their respective therapist. Seriously, couldn't they think of something more festive for such a happy occation? They left pretty much after only being at the restaurant for 45 minutes, and that left my attention dedicated to the younger couple. For one thing, the second my mother and I sat down, Brie would include us into Beau and her conversation. When someone is on a date and they are "feeling" the other person, they definitely DO NOT want to be interrupted by other individuals...especially a mother/daughter couple. That person wants their respective other's undivided attention and vice versa. Secondly, Beau was always leaning into Brie...clearly trying to get closer to her. However, she was sitting with her back completely against the chair. When you are attracted to someone you tend to be unintentionally drawn to them. Cleary Beau wanted to be closer to Brie....yet she wanted there to be more "platonic" space. Finally, Beau kept bringing up the idea of Brie coming back down to NYC for another visit (mind you she had just gotten there about 6 hours earlier.) Brie, however, kept making up excuses about things coming up in her schedule...and how long distance would be hard. When you like someone...you MAKE IT work! Either way....they were a very nice pair and my mom and I had a great time evaluating their interaction with one another. We also loved our dinner, and I had the BEST DESSERT of my entire life there. It was a chocolate tart with peanut crumbles and peanut butter ice cream...INDESCRIBABLY GOOD! Get it if you ever go! After dinner, Toni and I headed back to the hotel. We did not want to go out to Times Square and battle the crowds...so we decided to go back to our room and pop open some champagne. 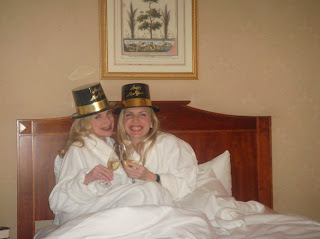 Below is a pic of us bringing in the New Year in the comforts of hotel robes and bed! After, a great night's sleep, my mom and I woke up and decided to keep up our normal morning routine of having a cup of coffee and a banana. So we picked up the phone and ordered some room service (don't you love staying in a hotel!!!!) When it arrived my mom took the bill to sign the ticket, and I noticed a look of complete shock come across her face. Soon I would find out that our one banana cost FOURTEEN DOLLARS!!!! EEK! More than our pot of coffee....so word of the wise...walk outside and buy a banana from the street vendor right outside the hotel door. That banana is only 99cents and it is served room temperature. The hotel banana was served cold, and we like our bananas tepid! After breakfast, Toni and I got ready and went out to walk around the city some more. 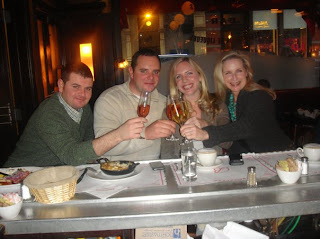 It was not long till we were hungry again and decided to go get some fries at Balthazar. 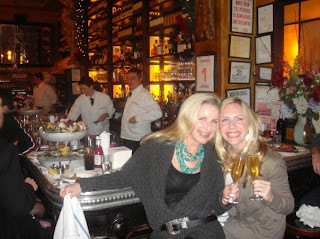 I have been to Balthazar several times before, and it is probably my favorite spot in NYC. Not only do they have some of the best french fries in America, the dynamic in the place is unbeatable. It is loud, lively, and just plain awesome (plus I had a Coutrney Love sighting there once.) Anyway, back to Toni and me, there was absolutely no where to sit and a two hour wait. So we decided sit at the bar. Throughout our appetizer and main course (an onion/goat cheese tart and a steak with fries) I could not help but listen to the two guys next to me...and ok...I know what you are all thinking...Olivia! You are so nosey! But I promise I am not! It is just that yet again I was pretty much sitting in someone else's lap! Either way, they were two Irish guys that were talking about the night before...they both witnessed two girls in a fist fight. They noticed that I was eavesdropping and called me out on it. This was the beginning of a great friendship. My mom and I spent the rest of the meal getting to know Derrick and Richard, and of course they became my best friends because they both let me try their desserts! Richard took this awesome picture of my mom and me. And here we are all together! Richard is closest to me, and Derrick is on the far left. After hanging out with our favorite Irishmen, Toni and I had to gather our belongings (or should I say all of HER belongings) and head to the train station. My mom decided one round of the bus was enough for her...so we took the train back to DC. It was an amazing trip with Toni...and I look forward to our next adventure. She is my favorite travel companion and my best friend! I wouldn't be the person I am without her, and she teaches me something new every day! I love you Toni...and we love you New York City!! !